When Can We Get in the Spring Garden? This is the time of year when Extension Service employees and garden center workers have a mantra: Stay off the grass. Stay out of the garden! It takes a long time for soil that has been as frozen as ours was this year to thaw out, dry out and be ready to handle the pressure of shoes, tools and full-on gardening. The Minnesota Department of Transportation has a cool system for monitoring frost depth in different parts of the state. In Ada, Mn,, for instance, way up near the Canadian border, the frost depth went down to more than 65 inches this winter—that’s a lot. And, even after ground thaws, it’s still going to be awhile before it is ready for gardening. If you are interested in the science of freezing and thawing, here’s an easy to understand explanation. The buds are out. Soon it will be garden season again. Generally, you do not want to be on the lawn or on garden soil until it is firm underneath and fairly dry. If you are leaving footprints in the lawn, it’s too soon. As for when you can start gardening: My guess is in the next couple of weeks for southern Minnesota and a bit longer for the folks up North. As the lawn dries out, you can start to remove all the gunk that seems to gather in gardens over the winter—sticks, leaves, old plastic bags. Dispose of all of that in the proper place and remove any mulch that you may have put over plants. Don’t feel the need to rush any of this—if we get a cold spell or (gasp!) a blizzard like last April 16, you might expose plants to more problems. Start seeds indoors. It’s not too late and it’s fun to watch the seedlings grow. We have a number of great posts on seed starting on the blog. Start with this one. Re-do your containers. Aren’t you getting a little sick of that holiday container you created in December for “winter interest.” Now’s a good time to pull out the pine and add willow branches and other decorations for spring. Leave room to add some pansies later in the month when things warm a bit. Here are some ideas. Make sure your tools and pots are ready to go. If you didn’t clean everything out last fall, get out in the garage or shed and scrub and oil things up. Below is a short video from the University of Nebraska on basic tool care. 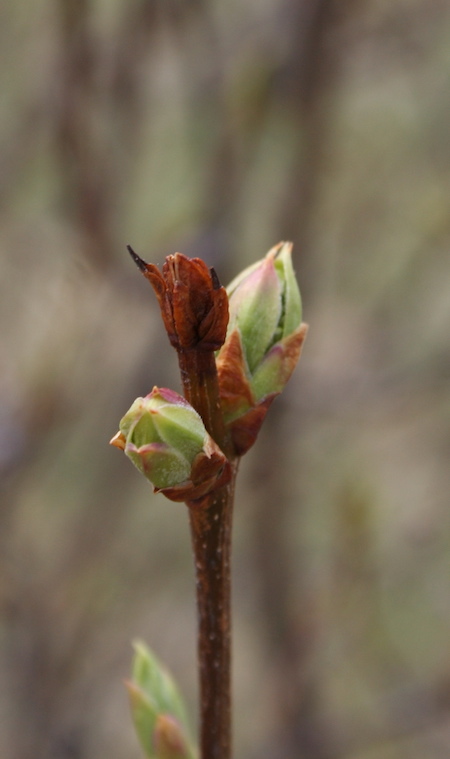 Do some phenology study. I love to keep track of when plants bloom year to year, and enjoy looking for other nature signs, such as spring peepers and when the robins return (some stay all winter!). Very helpful, easy to follow info! !